SALAH: "I hope I can make the Chelsea supporters happy!" 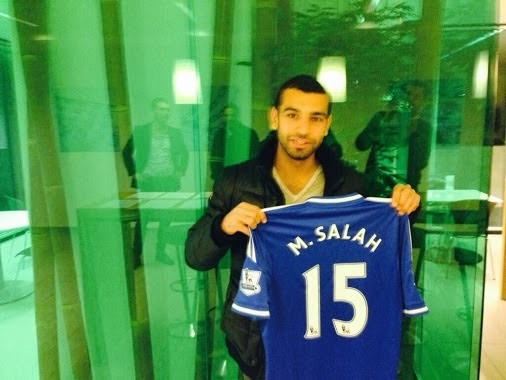 Mohamed Salah completed his medical in Paris over the weekend, officially signed a five and a half year contract with the club and will wear the vacant number 15 shirt. "I like the fact that he can play the same way our attacking players do, which is players with adaptability, to play right, left, or behind the striker. He's young, he's fast, he's creative, he's enthusiastic. When we analysed him he looks the kind of humble personality on the pitch, ready to work for the team and to work and to adapt himself to a new life. We believe if he comes that he will have a similar process to the Willian one. Willian needed two or three months to grow up and to feel comfortable playing for us. 'We think with him and (Andre) Schurrle, (Eden) Hazard, Oscar and Willian we will be fine. We lose an experienced top player like Juan, but we bring in a young player with great potential. Willian did that transition from his previous world to the top world of football. Hopefully, if Salah comes, he can do the same. We are ready to help, we are ready to support. He has some experience in Europe, the Europa League, Champions League, so he's not a naive boy arriving in the jungle. I agree with Jose Mourinho here 100%. If you look at Salah from our past experiences of playing against him we can all agree on two things, firstly he has blistering pace and secondly, he scores goals. If anything I personally feel that Chelsea have done a fantastic job in signing Salah because (and as Jason Cundy re-iterated on Chelsea TV yesterday) Juan Mata was not blessed with fantastic pace and struggled to get into the framework of how Mourinho wants his side to play. All of our attacking midfielders are quick and versatile and Salah will add to that in the wide areas.